If you don’t want to just play the piano, but to have a piano to add ambience and beauty to your home, the LAGRIMA Digital Piano is a great choice. 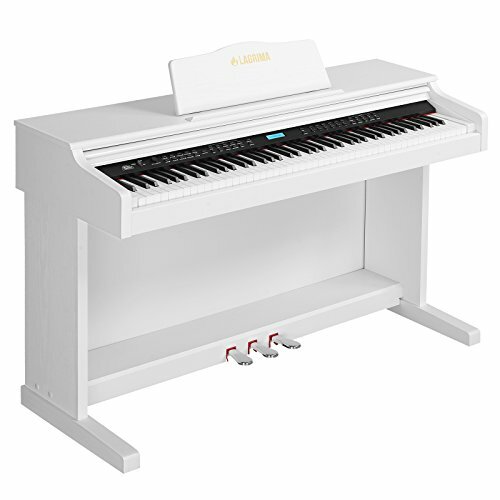 It has all the features and convenience of a digital piano, in a handsome console that will look great in your house and provide an authentic piano playing sound and feel. With the LAGRIMA Digital Piano, you can have a handsome, full-featured digital piano in an attractive console, showing and sharing your love of music in your home. It has all the visual impact of a spinet piano, and naturally invites students, friends, family, and guests to gather, enjoy, and share music with each other. The warm, natural sound is inviting and appealing. The LAGRIMA Digital Piano is great for beginners and learners. The full-size, 88 key keyboard is weighted to feel like an analogue piano. The pedals are fully operational, to help provide the practice and experience of playing an acoustic piano. This model also has all the digital voices and functions to take advantage of a range of digital options and experiences that a traditional piano doesn't have. It's the best of both worlds, at an affordable price, in a beautiful package. The LAGRIMA Digital Piano is designed for those who want to learn the piano with the key weight, finger technique, and console style that will transition best to playing an acoustic piano. GHS key weight and touch sensitivity help learners master the finger strength and precision necessary for playing an analogue piano, but the LCD screen, duo mode, and demo songs make it easier to learn than ever. For those who want to learn the piano with the ambition to play a concert piano, or who need to transition from an acoustic piano at school to a more affordable digital piano at home, it's a fantastic option. 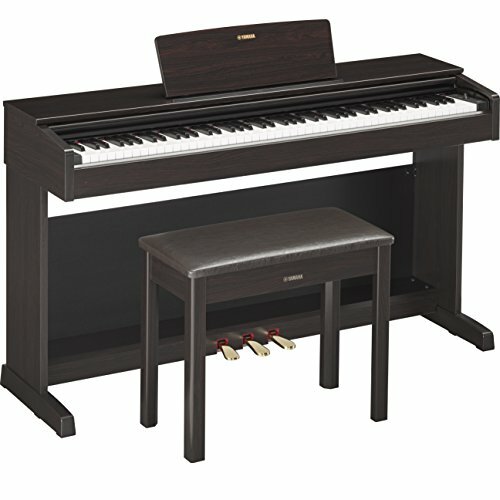 It's also a great choice for those who want a compact, convenient piano in their house for their simple enjoyment. The ability to adjust the volume or play with headphones allow a player to enjoy the piano without fear of disturbing others, and yet you can still have the unique experience of gathering family and friends to hear and enjoy music in the setting of your own home. 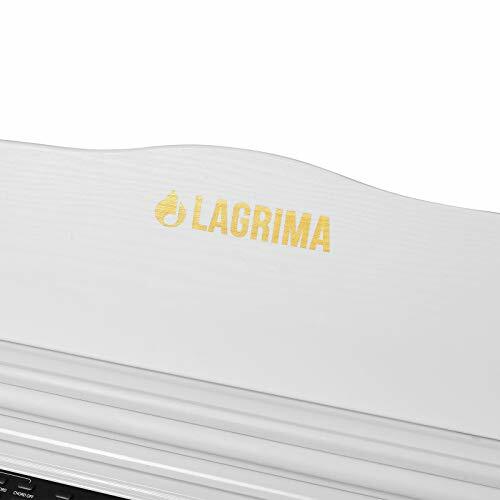 The LAGRIMA Digital Piano comes with a sheet music stand, a power adapter, a 3-pedal board, and an instruction book. The handsome console design is available in black or white. 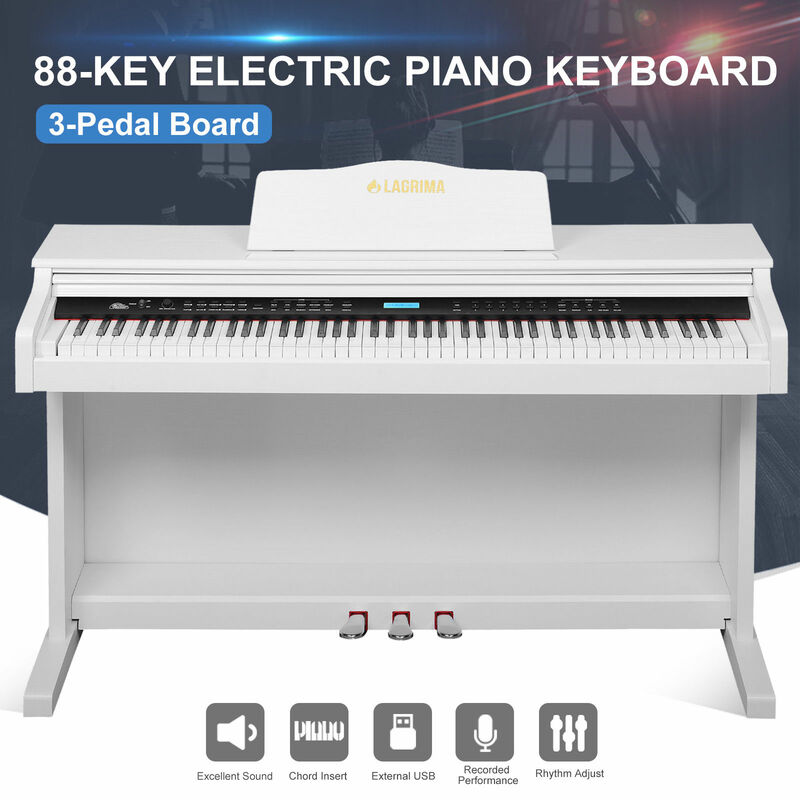 The full size, 88-key keyboard uses a graded hammer standard key weight, providing more weight in the low notes and lighter weight on the high end, replicating the feel of the hammers inside an acoustic piano. This weight builds finger strength and precision, and makes it easier to transition seamlessly to and from an acoustic piano, and is the best way to learn. It comes with your choice of 480 tones and 128 standard MIDI tones. It also has 200 preset rhythms and comes with 80 demo songs. It is capable of up to 64 levels of polyphony, for complex, overlapping sound. Piano teachers can split the keyboard in half, so that teachers and students can play beside each other and learn how to play the piano properly. 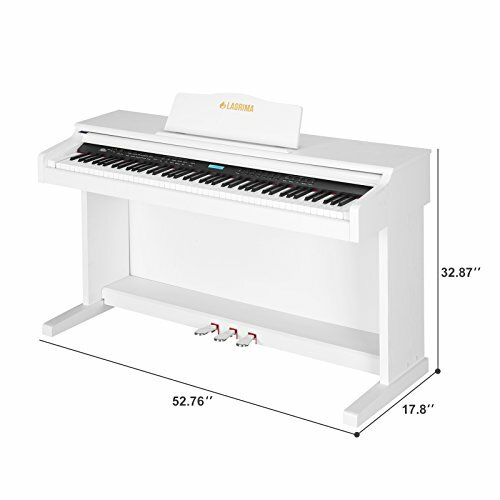 The built-in pedal board, sheet music stand, and folding flip cover look much like a compact, traditional piano, adding to your home décor as well as your piano playing experience. Touch sensitivity adjusts the key volume depending on how hard the key is pressed, just like an acoustic piano, and is recommended for learners. However, this feature can also be turned off if you prefer to have a consistent volume. The DSP2000 sound sample of the LAGRIMA Digital Piano has a clear, vivid, expressive sound better than expected in a piano at this price range. Built-in stereo speakers give good sound, resonating from below the cabinet as in an upright piano. The LAGRIMA Digital Piano has dual headphone jacks, ideal for piano lessons or quiet duets. It also has a USB port for digital devices, and MIDI input and output. The LAGRIMA Digital Piano is the most affordable digital console piano on the market, and it's a remarkable price for a full-weighted keyboard with 3 foot pedals. However, some experienced piano players, accustomed to an acoustic piano, do not like the key weight or sound of this digital keyboard. For those who want a digital console piano with a more authentic, grand piano sound and key weight, the next best option is the Yamaha YDP-143, which has a much more authentic playing feel and sound (but is significantly more expensive). For an improved key feel and sound, that more closely mimics an acoustic piano, you have to either spend several times more money, or go with a keyboard-only design, that lacks the console and the pedals. 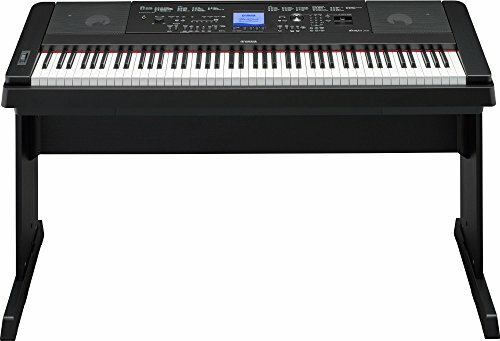 A good option would be the Yamaha P71, which also has 88 full-size, fully weighted GHS keys, and comes with a sustain pedal. The Songmics Padded Wooden Piano Bench Stool with music storage is an excellent complement to the LAGRIMA Digital Piano. It also comes in black or white, and is a compact size that won't overwhelm the LAGRIMA piano console. It has a padded top with a highly resilient cushion for extended piano playing, and a faux leather top for classic style. 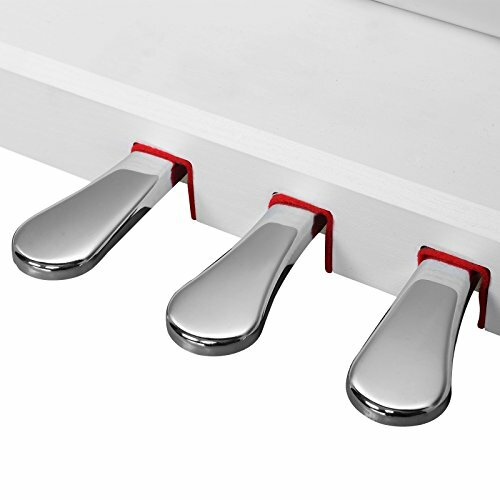 It is waterproof and dust proof, making it easy to clean and preserve the look of your piano set. It is made of solid wood and will hold up to 300 pounds, suitable for years of use. The rubber pads on the feet prevent sliding and slipping on the floor, without screeching. 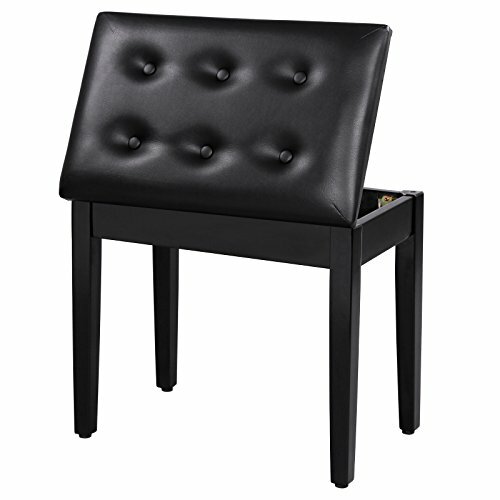 It has internal storage for sheet music, with a hinged lid, like a traditional piano bench. Unlike the LAGRIMA Digital Piano, assembly is fast and simple with the included tool and instructions. It is handsome and surprisingly affordable. If you want to use the LAGRIMA Digital Piano to learn piano for the first time, piano stickers are incredibly helpful. 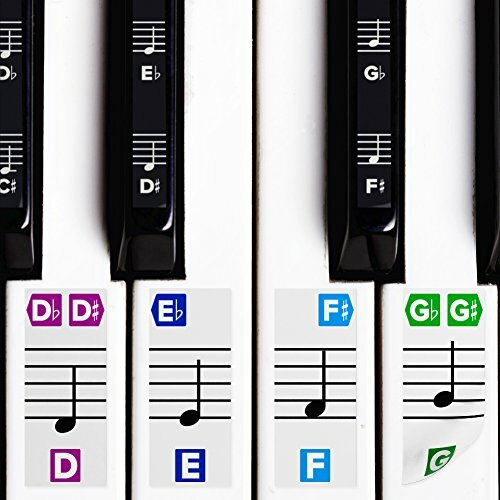 These stickers adhere to the keys and help you learn to read music and perfect you finger technique. The CRBN piano stickers are an excellent choice; they are printed on the underside, to preserve the ink and printing while the piano is being played. They remove cleanly, with no residue, and are large and easy to read. For the appealing look and style of a traditional piano in your home, there is simply no more affordable option than the LAGRIMA Digital Piano. It's the most approachable digital console piano in the marketplace. 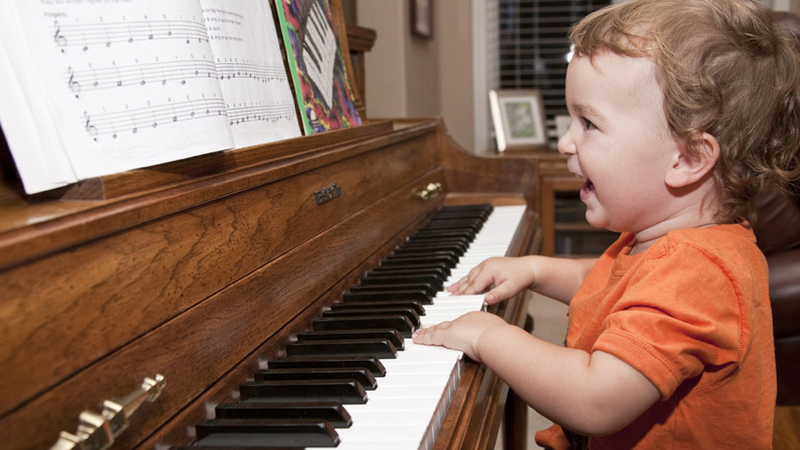 It also has all the essential features for beginners to learn with if they plan to advance their formal piano playing skills, including a full 88-key keyboard with full-size, fully weighted keys using the advanced GHS weight system, touch sensitivity, and 3 pedals for an experience that mimics the experience of playing an acoustic piano. It's the most affordable way to learn and practice skills that will transition easily to an acoustic piano. It also has the advanced digital features that acoustic pianos don't have, including a wide selection of tones, rhythms, polyphony, and even simple volume controls to make it easy to live with. Recording and playback, transpose, and split keyboard functions offer a range of possibilities and capabilities that invite learning and exploration, as well as affording unique opportunities for growth and expression. 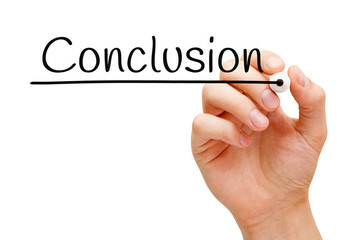 Most keyboards offer a fraction of the features at more than double the cost. This powerful, versatile, handsome digital console keyboard simply cannot be beat in its price range, and is a fantastic choice for piano lovers everywhere.